If you like paddling through marsh, this is your ticket, especially in early spring, where there’s lots of birds coming and going. Ultimately it’s a very pleasant, pretty stretch that often feels intimate and it’s a good short trip for beginners or kids. Time: Put in at 2:00p. Out at 3:50p. Wildlife: More sandhill cranes than I think I have ever seen on a single paddling outing, plus a gazillion Canada geese and dozens of mergansers. A marsh in March is much like an airport, a hub of various migrations coming from hither and yon. That’s the best that I can say for a trip like this but take my impression with a grain of salt because paddling in marshes just isn’t my thing. But this is a nice stream, very close to home, with no serious obstructions and a ton of wildlife to watch. Adding a leg to this trip, down- or upstream, would be a nice addition too. Marshes have their own time and place and the turn of the equinoxes make for great occasions. The cranes! The cranes! I stopped counting after forty. They were everywhere. The many mergansers were a welcome touch too. This was my first time on Duck Creek, so I can’t say whether the water level was high, normal or low but the current was always good. The bottom is generally sandy (muddy in some parts) and the levels ranged from 18” of water to deep enough where my paddle blade couldn’t reach the floor. There are a couple downed trees in the water but the fun kind that require some thoughtful maneuvering (nothing complicated or technical). While flat, which I ordinarily dislike, the sense of vastness sprawling in all directions is a nice effect. The setting feels mostly isolated, just you and a gazillion birds. It was crazy windy! I had checked the weather just before I left and while the temperature was only going to reach a high of 28 (but sunny), the wind was clocked at 5-10 mph, which is practically nothing in Wisconsin. But I was dead against it for almost the entire trip and since marshes are essentially flat, there’s nothing blocking that sweep of wind. So that was, ahem, a drag, the more so since I was fighting off a sinus infection. There is some development along this short 6-mile trip but not much (a couple houses midway, a campground and then Highway 51). There’s no stunning scenery either but I suppose there doesn’t always have to be. The takeout’s a little tricky. To begin with, Duck Creek Road is only a road for a hundred yards or so, it’s mostly a snowmobile trail. You can drive down it, at least, I did (and later on, I saw two trucks full of teenagers drive down it, scoping out their fishing holes) but it’s a very rough road and your car will scrape quite a bit if it’s low clearance (plus gauging whether something can or should be done based on teenage boys is probably a bad premise!). Should you wish to avoid this, you can either leave your bike or vehicle where a sign says “Do Not Enter” or “Road Ends” (I forget which) and walk to/fro the bridge (probably a 75-yard walk at that) and if you have a kayak caddy, this would be a great use for it. Or, in warmer weather, you can paddle up the back channels towards where Duck Creek Road becomes a snowmobile trail (it was still ice when I paddled this) but it looked like a potentially muddy takeout. 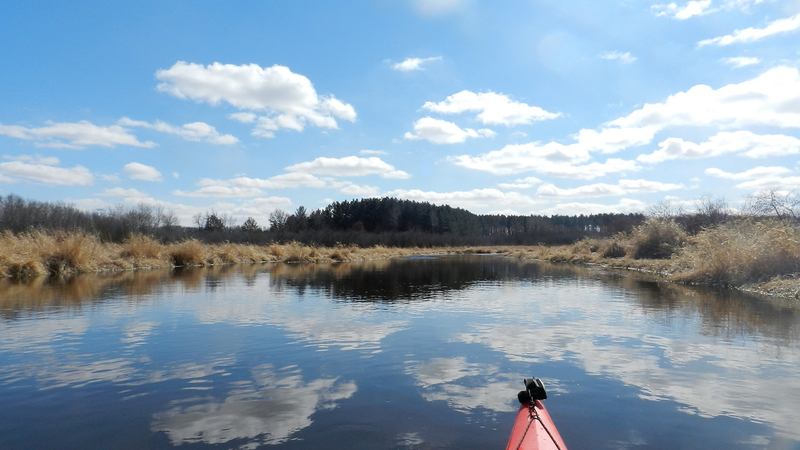 I would do one of two things: Put-in at the official boat launch in Wyocena and add 2.7 miles to this trip (there’s a dam you must portage) or put-in at Duck Creek “Road” and paddle through the floodplain bottomlands into the Wisconsin River, taking out in Dekorra. There are other segments of Duck Creek further upstream but accesses are tough. There are other dams, some of it runs through public hunting grounds and water levels would probably be fickle. The put-in at County Road G.
Generally wide, glass-like and pretty. While marshy, the creek twists and turns constantly. A couple honkers hanging out on the ice. Not the “haystacks” I’d prefer while paddling but pretty all the same. The power plant is regularly in view during this trip. Rusted iron bridge by take-out. Take-out on river-left on upstream side of bridge.